Celebrate Truck Driver Appreciation Month! While we celebrate Trucking year-round, Truck Driver appreciation Month is all about YOU, the truck driver! 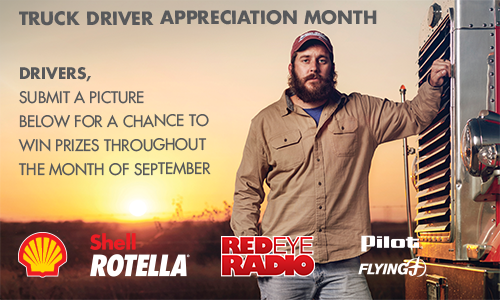 Red Eye Radio and Shell Rotella will be celebrating the truck driver during the entire month of September. We know that YOU are the heart of trucking. And there is more to you than what people see while you’re on the road…. so post a picture of you, your family, your truck. Tell us what made you want to become a trucker. We are extremely proud of this industry and want to celebrate each and every one of you. Pin to our Truck Driver Appreciation post on the top of our Facebook page and let us know more about you! From September 3rd through September 28th, Red Eye Radio will be selecting one featured driver from our Facebook submissions per day Monday through Friday to receive prizes such as a Pilot Flying J gift card, Cobra CB Radios and GPS units, Toughtested Earbuds, charging kits, Howes Lubricator swag and much more! Red Eye Radio and Shell Rotella would like to say thank you for being you. To learn more about Shell Rotella visit rotella.shell.com.